You did know I love GT40s, right? The loose blue and red cars I’ve had for a few years now. They’re some of my favorites, right up there with my Kyoshos and 2 Schucos. The packaged blue car has also been around for a while as it’s from the first release; actually, I have two. Those two are set aside as future customs, though I’m not sure when I’ll get to them. So that’s 7 so far! The white, black, and Gulf cars are all new New NEW!!! I was extremely excited to find the white car at my local walmart. Stunned, actually. 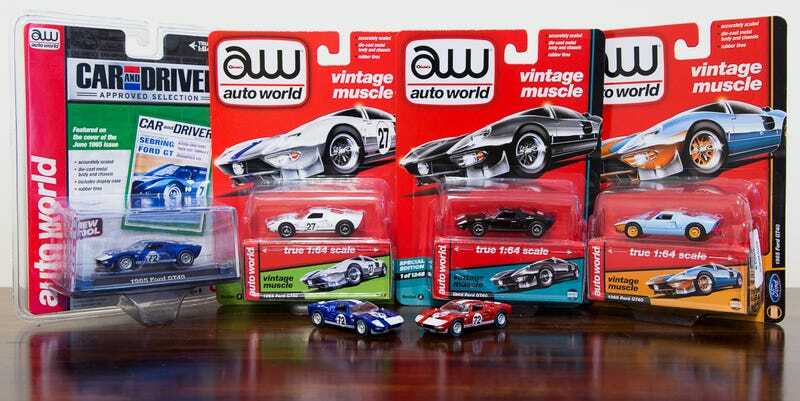 But at some point in the last couple of months I discovered that not only was Auto World releasing a white car and a Gulf car, but there were some exclusives as well. This gulf car that I have has no number, and no white meatball. Same with the black car. There is also a Gulf car that will have the white meatball, but no number. And there’s supposed to be a black #2 car as well, though it’s been harder to track down yet. I ordered the Gulf car because I doubted I’d find one in-store. As long as I have one Gulf car, that’s good; I don’t really care which version it is. I ordered the black car because . . . I had to. I mean, really, how could I not? If I can find the black #2 I’d like to acquire that as well, for a good price. blue stripe lined in red! The white and the black are both standouts for me. Gorgeous! I’ll probably open them all this weekend, but I need to savor it. I’ve been waiting for these guys for a long time! I even waited on opening the white one until the two pre-orders arrived!! Now, I’ll share my secret source. I saw Lamley recently posted about a new partnership with an ebay seller (surplusgoodies). I checked it out and wasn’t impressed with their prices. I’d already pre-ordered mine, for half the price of that store! You may be familiar with them, but I haven’t seen anyone talking about them, so I thought I’d share my source. I pre-ordered these two cars for $4.99 each. When I did that, Auto World didn’t even have them listed anywhere! I discovered them randomly. I just checked though, and you can get them for $7.99 at autoworldstore.com. $5 is better than $8! Well, now you know. You can’t say I didn’t share!